What constitutes a blockchain platform, its design goals, and how that should be assessed have been a source of passionate debate among experts. This can be confusing for technical professionals who must evaluate these platforms for real projects. 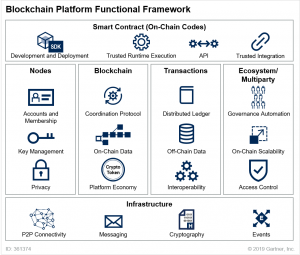 In the absence of a reference functional framework or asking the right questions, it is hard to objectively assess a candidate blockchain platform. This challenge is exacerbated by continuously changing designs, with innovative and technologically diverse components. 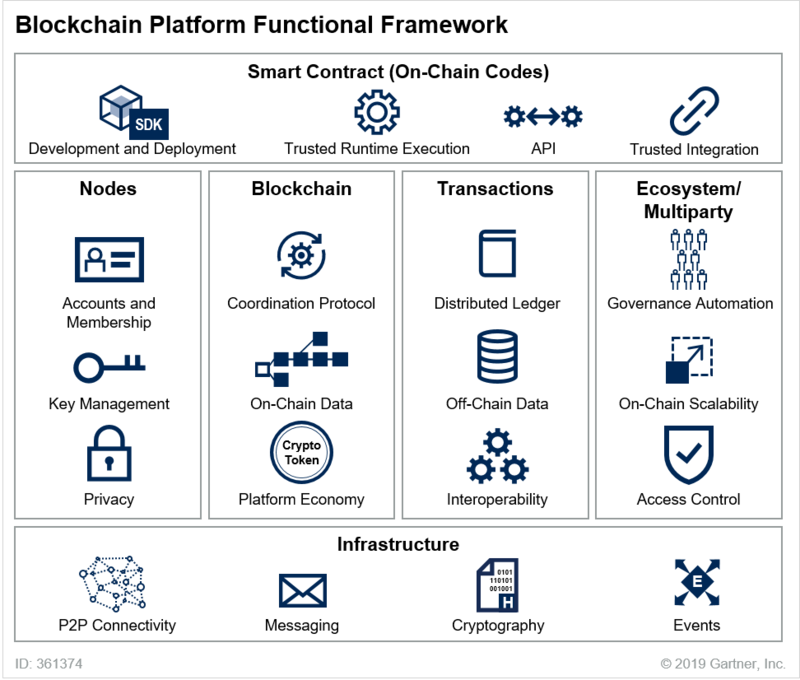 Our new Guidance for Assessing Blockchain Platforms report (published 27 March 2019 – G00361374)  provides a practical framework to parse a blockchain platform capabilities and related questions for each function. This hopefully helps technical professionals to assess a candidate platform (or framework), based on a technology-agnostic functional model as shown below. is applicable to public and enterprise platforms as two common design patterns. Public platforms enable decentralization in ubiquitous digital ecosystems. Enterprise platforms implement a distributed ledger in multiparty business environments. takes into consideration that future blockchain platforms will go beyond basic capabilities. Next-generation platforms offer interoperability and usability functions to set up and run more reliable production-grade digital ecosystems. This is while the line between public and enterprise blockchain platforms will start blurring. That is through interoperability protocols or configurable features to operate chains in either public or enterprise mode. Finally, technical professionals should assess a platform in the context of decentralized web. Blockchain is only one of many technologies in the decentralized web stack. The report touches on these evolving components such as layer 2 protocols, related platforms, and decentralized identity. It leaves the details of decentralized web stack for future reports. Full report is available to Gartner subscribers.